HOUSTON – (March 22, 2018) – It's easy and economical to make shiny pellets of graphite from functionalized graphene, according to scientists at Rice University. A report in Carbon shows how chemically altered graphene powder can be pressed into a lightweight, semiporous solid that retains many of the strong and conductive qualities of graphite, the form of carbon found in pencils, lubricants and many other products that normally requires high-temperature processing to make. Mohamad Kabbani, a former graduate student of Rice materials scientist Pulickel Ajayan and lead author of the paper, demonstrated the environmentally friendly, scalable process can be done in minutes by hand by grinding chemically modified graphene into a powder and using a hand-powered press to squeeze the powder into a solid pellet. Kabbani previously showed how carbon nanotubes could be turned into graphene with a mortar and pestle rather than harsh chemicals. This time, he and his colleagues demonstrated how to make a battery-sized pellet, but the graphene powders with chemical functionalities attached to it can be pressed into any form. Kabbani said the material could be suitable for structural, catalytic, electrochemical and electronic applications. "This is the first time anyone's made these at room temperature and without very high pressure," he said. "Usually these kind of materials require sintering (a process that uses pressure or heat to form solids without melting them) at temperatures above 1,000 degrees Celsius to produce strong pellets. In this case, mechano-chemistry at the nanoscale saved us a lot of energy and money." The process began with two sets of functionalized nanotubes, one with carboxylic acid and the other with hydroxyl molecules. Once crushed to combine them either by hand or machine, they are placed in a lab-scale hydraulic press and subjected to 5 tons of pressure. The functional groups cross-linked the graphene sheets to each other, and even though no liquids were involved, they produced a tiny amount of water as a byproduct of the reaction, Kabbani said. 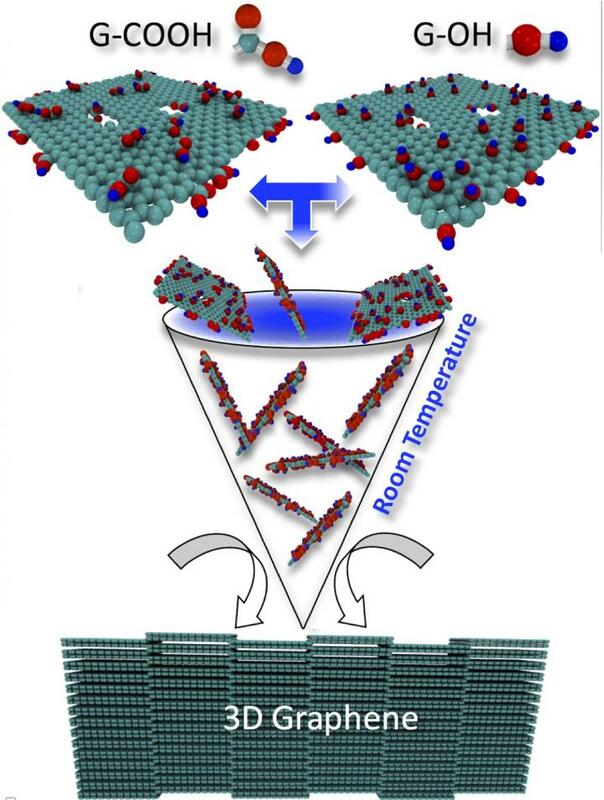 The pellets remained stable when placed in hot water for five hours, even when stirred; this confirmed the interlocking of the graphene sheets within, the researchers reported. The combination of light weight, high strength and high conductivity is appealing for applications such as conducting cables and electrodes, Kabbani said. "The pellet material is stronger and lighter than commercial graphite electrodes and could be promising for electrical storage applications with high energy and power densities," he said. Co-authors of the paper are postdoctoral researchers Vidya Kochat and Matias Soto; Chandra Sekhar Tiwary, a former postdoctoral researcher at Rice and now an assistant professor at IIT Gandhinagar, India; Sanjit Bhowmick and Syed Asif of Bruker Nano Surfaces, Minneapolis; Anirban Som, K.R. Krishnadas, and Thalappil Pradeep of the Indian Institute of Technology, Madras, India; Ahmad Kabbani of the Lebanese American University, Beirut; and Enrique Barrera, a professor of materials science and nanoengineering, and Robert Vajtai, an associate research professor of materials science and nanoengineering, both at Rice. Ajayan is chair of Rice's Department of Materials Science and NanoEngineering, the Benjamin M. and Mary Greenwood Anderson Professor in Engineering and a professor of chemistry. Mohamad Kabbani is now a research scientist at Shell International Exploration and Production. The Department of Defense, the Air Force Office of Scientific Research, the Government of India Nano Mission and the state of Nuevo Leon, Mexico, supported the research. Supercomputing resources were provided by Rice's National Science Foundation-supported DAVinCI supercomputer administered by the Center for Research Computing and procured in partnership with Rice's Ken Kennedy Institute for Information Technology.